The New England Patriots have not been swept by the Dolphins since the 2000 season, but for some odd reason, Miami wide receiver Jarvis Landry thinks this is the year that changes. On Monday night, during a promotional tour of the NFL in the UK, Landry made some pretty bold predictions about this upcoming season. 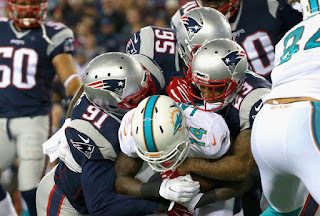 For Landry’s claims to come true, the Dolphins are going to have to overcome some major feats, as Patriots quarterback Tom Brady has never been swept by an AFC East opponent while as a starter. New England has also swept an AFC East opponent 27 times since 2000, including Miami in 2016. Peter King also notes that the Patriots led the Dolphins by a combined score of 44-0 at the two-minute warning before halftime in their 2016 games. That’s one of the many things the Patriots do well – focus on executing their own game plan and not worrying about the other team. If anything, Landry has only lit a fire into New England and their fan base, and the Patriots will absolutely want to prove him wrong.